The brahmaparusha is a particularly horrifying vampire of India. This vampire is a malevolent spirit who takes delight in eating humans. They are extremely vicious and consumed with bloodlust, and a hunger for brains. Their appearance alone is grotesque and terrifying; these vampires would wear intestines around their necks from victims they had destroyed. They would also wear intestines around their heads like a crown, showing off its trophies from previous kills. It has a sick pride in its slayings. The brahmaparusha is also known for carrying around a human skull. When it attacks a new victim, it will pour the blood out of the victimâs neck into the skull. It will then drink the blood from the skull, using the human skull like a cup. After it has drained the victim completely of blood, the vampire will then go on to eatâ¦ brains. For whatever reason, this vampire will always devour the brains of the victims it has fed on. And then it will go on to rip out the intestines of the poor soul. The bloodlust of this vampire is so great that the brahmaparush will feast on many humans before it has had its fill. There are no known ways to protect against this especially ferocious vampire; running away and hiding is basically the only chance of escape. After the brahmaparush has finished feeding, it will wrap the intestines of its newest victim around its waist and begin a ritual dance around the corpses. It is unclear how the brahmaparush are created. Many Hindu myths of vampires describe the creatures as being a class of demons separate from humans, who may inhabit the corpses of humans and possess them for a time, using the human body to complete its feeding. It would be interesting to know if one could be reincarnated into a demon class after living a life of evil actions, amassing a lot of bad karma. Whether these vampires were once humans or are simply demons who have existed from the dawn of time, they are a very gruesome set of creatures. good one. specially the dressing with intestines. plz tell me does vempires exist nowadays???? This is the third time I’m trying to comment. Please be aware the photo you are using is wrong. The content is not wrong, but the image is of a deity. 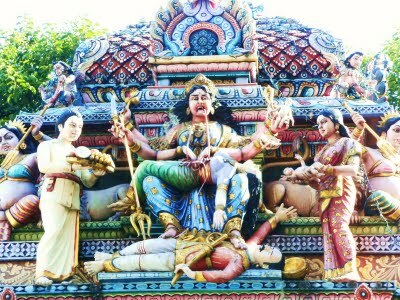 She is a fierce goddess named Periyachi. Please google her.